East Branch & Lincoln Railroad, by Erin Paul Donovan, 2018. 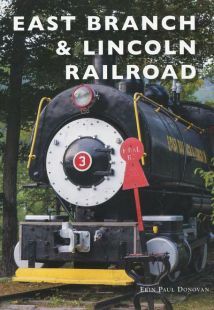 Photographer and Pemi Wilderness explorer Erin Paul Donovan has compiled a wonderful collection of both archival and current photos of the East Branch & Lincoln Railroad, which operated from 1892-1948, using more than 50 miles of railroad line. The author has culled numerous historic photos from several archives, and includes many of his own photos showing artifacts and sites of the EB & L as they look today. Anyone who hikes in the Pemigewasset Wilderness - where most of the trails follow former railroad beds - will enjoy this book. 96 pp., 6 1/2" x 9 1/4."